The Studio Apartment has recently been refurbished, has underfloor heating throughout and will comfortably sleep two with the possibility of a third. 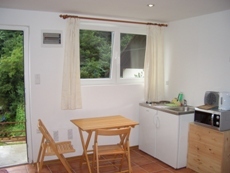 The kitchenette provides the option of self-catering. It also features cable TV, wifi and has a wonderful terrace to relax enjoy the view and the weather. The sleeping area is spacious with storage for luggage and clothes. 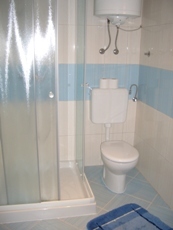 The bathroom is light and airy, with brand new facilities. The kitchenette facilities provide the option of eating at home.